Moments of Mommyhood: Some Honest "Scrap"
Joanne at Barely Domestic Mama has bestowed upon me another award! I love it! These awards really do make me smile! Thank You Joanne! Sorry I did not post it sooner, I have been crazy busy lately. 1. Choose a minimum of 7 blogs that you find brilliant in content or design. 2. Show the 7 winners' names and links on your blog, and leave a comment informing then that they were prized with "Honest Scrap", the nifty icon they can display proudly on their blog. 10. Okay, I cheated! This is from another post I did! My bad! At least I was honest about it! 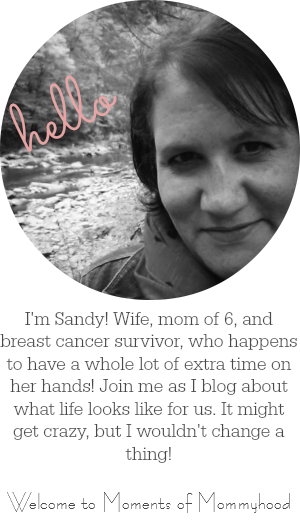 I am going to pass this award on to some of my newest bloggy friends! Sorry, I cheated again because I only picked three blogs. That does not mean I don't love you all! Hey cheater! Ha ha... I'm with you on #1 and #7! I used to love vacuuming but my darn dog sheds so much I have to do it all the time! I love the result, just wish it lasted longer. Good Honesty! Especially the last one. LOL!! I love Pepsi too and I'm impressed that you were able to quit. When I was in high school I wanted to be a secret agent! I'm doing the "Go Sandy" happy dance...CONGRATS!!! Congrats! and you love laundry? oh girl, come over here. I'll make ya real happy! Hee hee! I like to color too! I also don't mind doing the laundry, hate putting it away. I like to vacuume. I prefer to shop online where I can't be bothered. I love to vacuum too! I like seeing the marks in the carpet. Thanks for visiting my blog! You can come vacuum and do my laundry ANY TIME! I've got plenty of both! LOL. I'd rather clean the kitched or do the dishes. Fair trade? My kids love the vacuum when they were infants. It would stop the crying. Though, I could not hear the TV. I missed a couple of GH episodes that way. Thank you! I will definitely be adding my addiction to that crazy ice cream you showed off here! (Oh..I love to color too!) I also love to vacuum...laundry..not a fan! Will post my award asap! Congrats on your award - I love pregnant bellies too! Haha! I feel your pain for #5. I AM a Pepsi addict! I haven't found the will to ditch the hatbit! Hi, here from sits. I see you have five kiddos, I have four lovelies myself and there will be no more for me! I'm a recovering Diet Coke addict myself, it was hard. Congrats on the award! I love to vacuume too! Every day!! I just can't stand dirty floors, lol! My new stamping "thing" allows me to color - alot! - and with grownup stuff. So I guess I've graduated from Dora and Disney Princess coloring books! This was fun to read. LOL I LOVE doing laundry, even whites. It's therapeutic for me.